It was a bright, clear and sunny Sunday morning in 2006. Los Angeles never looked more beautiful. Massive, in-your-face billboards, boulevards vast and desolate, cracked sidewalks and all. The freeways were clear. For once. So many months we had run through this scenario, talked through it – talked through it some more, rehearsed the drive to the hospital. And now here it was. The arrival of our first born was imminent. Luna – Luna – Luna. On the way to the hospital we made all the appropriate phone calls to family members. Then we made all the appropriate phone calls to fellow Book Club members. In one adrenaline-infused breath I revealed our news and apologized for having to cancel Book Club. But we’ll reschedule as soon as possible!, I kept repeating on various voicemails. Hey, what if we had Book Club at the hospital? – I wondered out loud. No really – I think it could work – I insisted to a very anxious father-to-be – Drew. All this before the first nurse at the hospital stuck the happy – to sad – to very much in agony face chart in front of my face and asked me to point to the facial expression representing the time I would like drugs administered. I pointed to the happiest face. Seriously – why wait? All this before the medical residents that looked like they had stepped right off of the set of Grey’s Anatomy kept checking down below to see how much I had dilated. All this before my beloved Dr. K and Nurse “House” (affectionately nicknamed by us after the TV show Dr. because of her tough love approach) played good cop/bad cop to get me to work harder to get this new life out. I always appreciated my Dr’s clear, firm, realistic demeanor. Works for me. All this…before that-one-forever-life-altering-moment. When the comets collide – when the world stops and simultaneously the earth spins faster than proven possible and your heart as you once knew it no longer beats just for you. Your heart is no longer yours. She holds your heart now in her shriveled – been through a heck of a journey – newborn hands. You look to your partner – the only other person that understands this arresting seige of the heart – and in unison you both say “whoa”. She arrives on Book Club Sunday. We recetly celebrated 11 years of Book Club. There’s six of us total – girls and boys. The past 11 years of Book Club have seen us through 60 books, just as many delicious accompanying meals, marriages, births (we just recently welcomed a new addition to our Book Club family – Keith and Heather’s baby L.) loss of loved ones, professional successes and heartbreaks, politics, presidents, but most importantly friendship; life-long friendship. 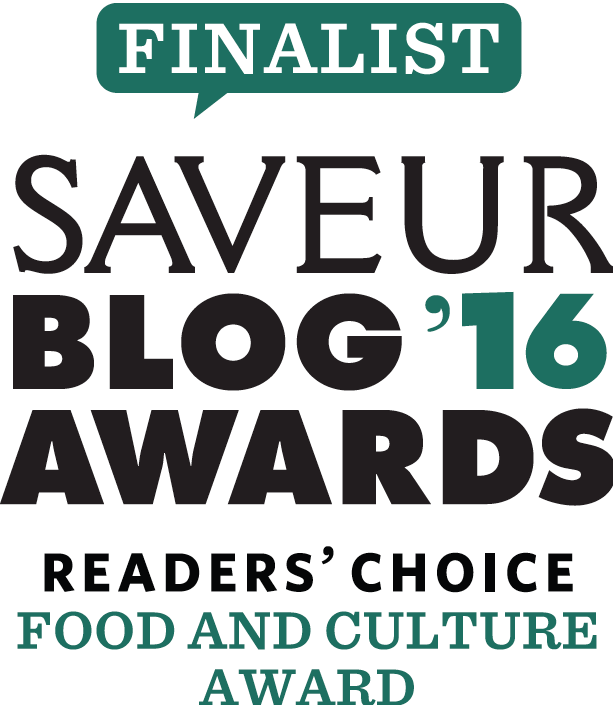 And of course, a love of books and good food. Our motto is “because we read” (most of the time). At this point the only way to get invited in is through blood or marriage (it’s hard enough to work around six schedules) or if you are the author of the book as was the case with The Drifts. What a pleasure it was to have the amazing Thom Vernon at our BC dining table. We take turns picking a book. Whoever has picked the book hosts and makes a meal that relates to the book. 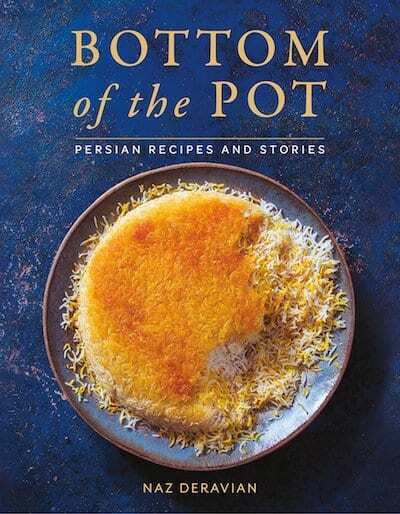 It could be a dish that is specifically mentioned in the book or it could be a dish inspired by the setting of the book. Plenty of room to get creative. And it is always fun to try and guess what will be served as you read the book. 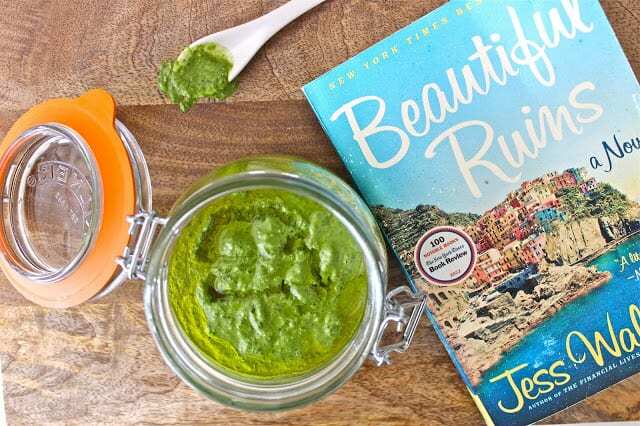 It was my turn to host last Book Club – the magical and glorious Beautiful Ruins by Jess Walter. It could not have been a better choice for a summer (or any other time of the year) Book Club gathering. And it should be noted that we all highly recommend it. One of the settings of the story takes place circa 1962 Italy. Perfection. Right up my alley. The Cinque Terre – Italian Riviera – Liguria. Pesto. Pesto comes from Genoa, the capital city of the Liguria region of Italy and is therefore referred to as Pesto Genoese. 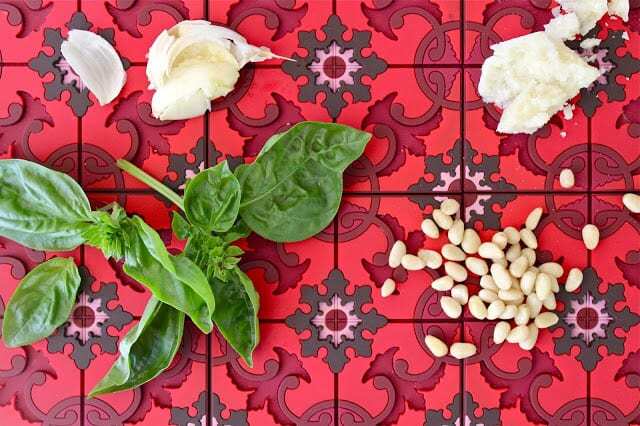 It is a simple and delicious sauce made from a handful of fresh ingredients: fragrant and lush basil, garlic, a mix of Parmesan and pecorino romano cheese, pine nuts and olive oil. 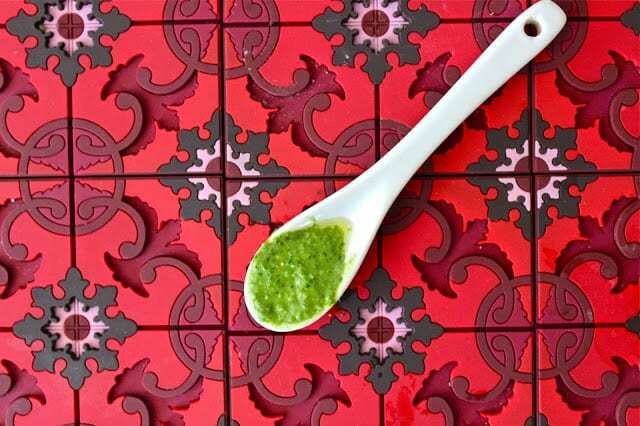 Traditionally, pesto (which derives from the Italian word pestare – to pound or crush) is made with a mortar and pestle. Since my mortar and pestle is not big enough and I like to make my pesto in large batches (it freezes so well – makes a great last minute potluck dish), I turn to my modern-day mortar and pestle – the mighty food processor. Depending on my mood and what I have available in my fridge and pantry, I might stick to the traditional basil and pine nut combination, or venture off and play around with other green herbs and nuts. I encourage you to try out any combination of greens like parsley, cilantro, spinach, arugula, kale (with heartier greens like kale it is best to give it a quick hot water blanche and then squeeze out all the excess water so it blends up easier in your food processor) and nuts like almonds, walnuts etc. 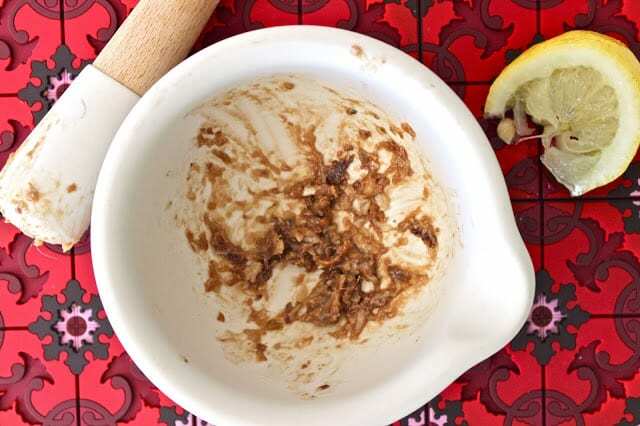 Occasionally I add some extra flavors like salty anchovies that I first pound to a paste with the garlic in my mortar pestle (don’t worry you won’t taste the anchovies), and a squeeze of a lemon to brighten up all the flavors. (Truth be told, I seem to add lemon to everything.) For a slightly creamier quality you can also try adding some goat cheese, butter or mascarpone cheese. The one thing I will not compromise on when making pesto is the freshness and quality of ingredients. Which is why I prefer to grate my own parmesan cheese. It really does make a difference and it can be done quite simply by cutting off the rind and throwing chunks in the food processor. A few quick pulses later you have freshly-grated parmesan. And remember, that rind can be frozen and used up later in a soup or stew. 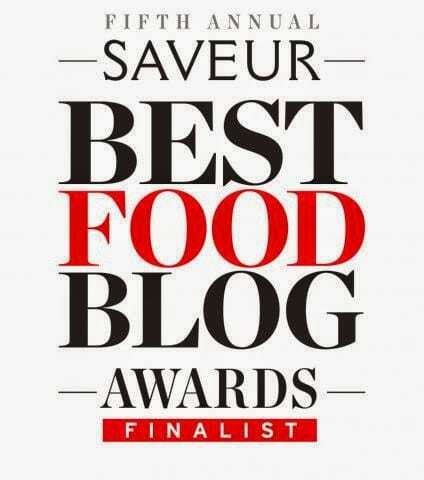 Marcella Hazan dictates that “a well rounded pesto is never made with all Paremsan or all pecorino”. I shamefully lower my head and admit that I do make my pesto with all Parmesan if I don’t have any pecorino on hand. 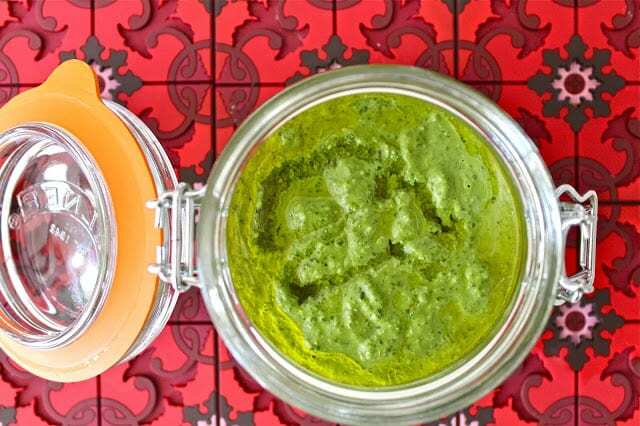 Pesto can be enjoyed over pasta, gnocchi or as a spread for a sandwich. It can be drizzled over soups as a garnish or spread on your favorite cut of grilled meat, chicken or fish. When serving with pasta, remember to put aside a little bit of the pasta water before you drain the pasta to thin out your pesto to the desired consistency. And please – for the love of everything that is delicious and good and right in the world – SALT that pasta water. This goes for anytime you are making pasta. I don’t mean delicately shaking your salt shaker over the pot – I mean SALT it as if it’s SEA WATER. Don’t question. Just do it. I still think we could have hosted Book Club at the hospital. Friends and family gathered to celebrate a new book but more importantly a new lover of books. Each of us taking turns holding her in that crook in our arm that seems to be especially made for this. If you would like to virtually keep up with our Book Club – the book we are currently reading is The Curiosity by Stephen P. Kiernan. Caprese salad, fresh figs, olives, marinated artichoke, prosciutto. Fish soup was the only specific meal mentioned in this book so I made a Ciuppin. Something similar to this. Shaved fennel and zucchini salad. Granita di Caffe con Panna inspired by this post. Thank you Deb for bringing back all the wonderful memories of Rome. 1- Lightly toast the pine nuts in a skillet on medium-low heat until they release their fragrance. Set aside and cool. 2- If using anchovies pound them with the garlic in a mortar and pestle until you have a paste. If not using anchovies you can add the garlic directly to the food processor. 3- Put all the ingredients except for the olive oil in the food processor. Blend and with the machine running slowly drizzle in the olive oil until everything is blended. Stop to scrape down the sides if necessary. 4- Adjust all seasoning to taste. Add more olive oil if necessary. Use immediately or portion off and store in containers in the fridge or freezer. 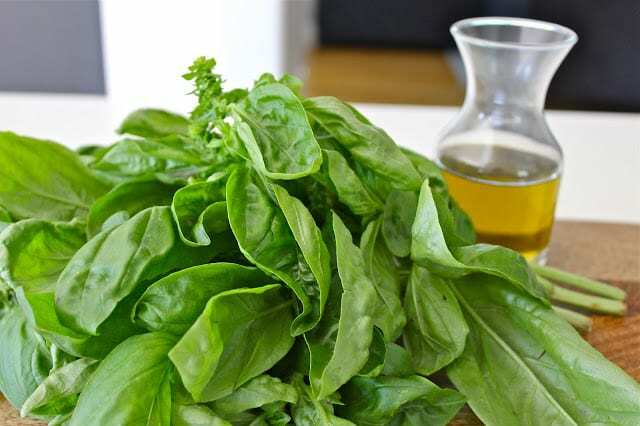 If placing in containers top off with a little olive oil to maintain freshness and green hue. I use roughly 1 cup of pesto per 1 pound of pasta. Do not heat up your pesto! If frozen allow to thaw and then use. Remember to thin out with pasta water if necessary. Will keep in the fridge for up to 1 day and in the freezer for up to 3 months.